One of the best vendors I hired! Worked with me with everything we wanted. Gave his opinion on what he thought worked best. Everyone raved about the amount and taste of the food. Since day one of netting with Kevan, my husband and I knew it was a perfect match for our special day. Our tasting was so much fun and Kevin's main priority was making sure our reception had THE BEST food and service. Kevin also knew how important it was for the menu to be a balanced variety of foods that all guests could love. You'll get delicious food for a reasonable price and a whole lot of fun if you choose to work with Moore Fine Foods. We can guarantee that. Thank you, Kevin!!!! The food was delicious. Kevin worked with us to get what we were looking for in the right price range. Our guests are still talking about how wonderful the food was. I knew they would be because I was blown away at the tasting. Kevin is very personal and it was a pleasure working with him. Kevin catered our wedding and everything tasted fantastic. We had multiple compliments from our guests saying its the best food they've ever had at a wedding. Not to mention, he made it while traveling because our wedding was in Jacksonville. We highly recommend Kevin! Thank you Kevin! So, we have yet to have the wedding -- it is planned for March 18, 2018! We are so excited and wished to let everyone know our experience thus far with our caterer, Moore Fine Foods! First of all, Kevin, the chef, was so responsive to telephone calls and emails. He was so quick, almost instantaneous! Amazing to me as he seems to also have so many other responsibilities. Second, he took time out of his busy schedule to do a COMPLETE taste testing for my whole family. No, he did not have us go to him, as we were having so many problems with trying to find time to drive to his location 1-1/2 hours away. He and his assistant came to us!!! I felt like a queen -- totally pampered with the beautiful place settings, aromas, and pleasant and comfortable conversations. And the food....! Oh my goodness. Fabulous, tasty, fresh, delectable! I can't think of enough great things to say about all of it. They brought everything from cocktails to dessert and it was all absolutely scrumptuous. Needless to say, I am looking forward to the wedding for so many reasons. However, I am hoping that all my guests have the same kind of experience that I initially have had with Kevin and his assistant and their great food! Kevin was great. Everyone loved the variety of the food. Everything tasted wonderful. Already sent him another bride. Kevin and his staff were amazing. Friendly and quick in their services. 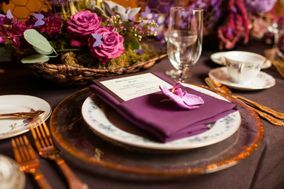 The food was amazing - my husband and I only had time for a few bites during our reception, but the food we did have was perfect and mouth watering, and our guests have raved nonstop since our wedding about the dinner and desserts provided. Kevin will work with you to build your perfect menu!